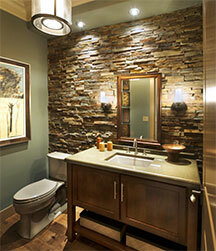 Ledgestone in Denver—What Are the Current Color Trends? - PetraSlate Tile & Stone is a wholesale supplier of quality flooring products from around the world. Visit us online to view our products Gallery. PetraSlate Tile & Stone sells limestone, marble, travertine and slate ledgestone in Denver and has for over two decades now. In all of that time, we have watched color trends come and go – and come around again. Color trends, like much of the interior design industry, play out by some colors of stone gaining popularity while others wain. However, authentic ledgestone in Denver represents a timelessness that is unmatched by paint or other less permanent décor. Every ledgestone product we offer has its own trend defying popularity because its enduring presence once installed leads to a careful decision by most end users. As all successful interior designers and decorators know, and many contractors and home owners do not, color trends do not appear spontaneously, they are purposely driven into public consciousness, and as the interest in those colors blooms, the “trend” becomes part of the public perception. Major color institutes like Pantone and others in the paint and textiles industry, “forecast” which colors will be trending about 18 months in advance. To gain insights into these trends, Pantone will be happy to sell you their bi-annual Spring/Summer or Autumn/Winter color forecasts for $750 each. To be fair, these sorts of products are based upon deep research into sales trends for various items, as well as monitoring how avant-garde artists, furniture designers, and fashion houses are using color, or dropping previously popular colors from the palettes of their work. The colors forecasted by the Pantone Color Institute to be popular this spring and summer were released back in early 2015. At PetraSlate, we encourage color experimentation with the available samples of our offerings. That said, the color of our various ledgestone Denver offerings do not lend themselves to being called “trendy” because their colors are dictated by the circumstances of their deposition in the earth’s crust. When discussing our samples of ledgestone for your Denver project with the home or property owner, we recommend that the stone be discussed as the foundational piece of the color palette of the room in which it will be installed. Ledgestone brings with it not only the visual interest of its color, the very cut of it lends a strong textural component to the space. The different depths and rough hewn horizontal lines of its dry stacked look will catch both natural and artificial light at different angles and cast shadows of varying depth. The trends in color can then be focused on any paint, upholstery, or flooring, and chosen to compliment or contrast with the ledgestone installation. To arrange for samples, or to obtain more information, contact PetraSlate Tile & Stone.